In a perfect world you'd be able to contact each and every one in your database personally. This is obviously impossible - in practice, email marketing campaigns are aimed at groups consisting of hundreds or thousands of people. This is not without its advantages - reaching out to a larger group means that there's a bigger chance that someone interested in your product or service will be among the recipients of your message. Moreover, it's probably a good idea to regularly catch up with your existing customers: research shows that 61% of consumers enjoy receiving weekly promotional newsletters. So, whether you're looking for fresh leads or brushing up on your old ones - email marketing is the way to go. 'But how to create a mass mailing campaign?'' - you might reasonably ask. Signing up for an account with Sugester is a good start. We've recently introduced a lot of features which make creating and sending out email marketing campaigns easy and convenient. The following paragraphs will guide you through the entire process, step by step. The first thing you should do is add your email account to Sugester. This allows you to send messages from an existing address which is familiar and recognizable to your customers. 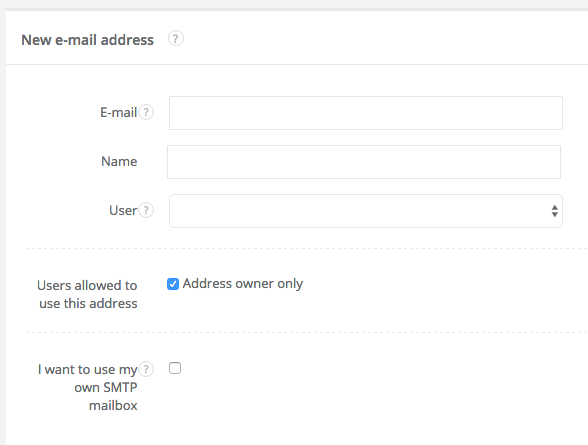 It's as simple as adding a new mailbox to Outlook, Thunderbird or Mail - just fill out a short form and (optionally) enter your SMTP server address, login and password into the fields provided. Advanced users may also wish to add an SPF record to their domain - this will help achieve maximum deliverability of your campaign. If you want to learn more about our approach to email, please follow this link to our knowledge base. The second step is creating a mailing list. There are two ways to do that in Sugester: by tagging existing customers or directly pasting a list of email addresses. If you have neither, you can also import an Excel (XLS) or CSV file into Sugester and automatically tag all the new entries so that they become part of your new mailing list. The third step is optional, but worth doing to save time in the future - create an email template to use in your future email marketing campaigns. Sugester allows you to upload HTML directly, which means that you're free to use free email templates from the web. If you prefer, you can also create your own template - Sugester includes a familiar text editor. The fourth and probably most important step is sending out your campaign. We made sure that it's not overwhelming or unfamiliar: the entire process is identical to sending an ordinary email. Just click the 'Send email' button, select your mailing list in the 'To' field - and done! If you wish, you can also select which address to send the campaign from, select a message template and add an attachment to your correspondence. After you're satisfied with your email just click 'Send'. Done! When you're done with your email marketing campaign you might want to check out some other features of Sugester, such as our CRM module, live chat widget or VoIP integration. Put together, these modules will help you organize and optimize your customer communications in no time. Not convinced? See for yourself and start a 30-day free trial with no strings attached!